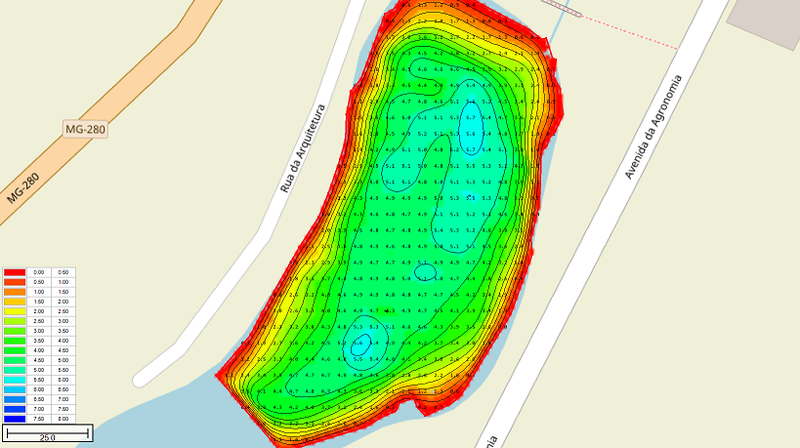 Contour lines are lines connecting points with the same depth, elevation or other data. Contour lines are also known as iso-lines. During the generation of contour lines from a sounding, the scattered points are converted to regularly spaced data using a TIN (Triangulated Irregularly Network). This TIN is generated using a Delaunay triangulation algorithm. After this step, Hydromagic calculates the contour lines by determining the positions where the depth contour crosses the calculated triangles. All these lines are connected to each other, and stored as a vector layer, which is saved as an AutoCAD DXF file and added to the current Hydromagic project. In addition, the generated contours can be smoothed using a B-spline interpolation algorithm in cases where you do not want unnatural looking sharp edges in the contour lines. 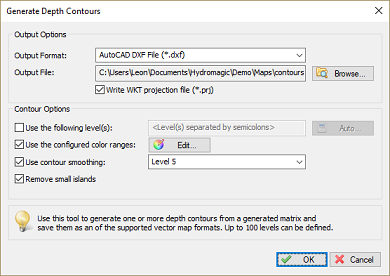 To generate depth contours, you must have created a matrix first. A matrix can be generated from depth data, bottom information data or other sensor data like temperature. 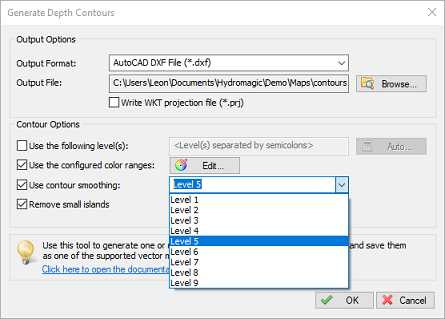 Use the output format drop down box to select in which file format you want to save the contour shapes. 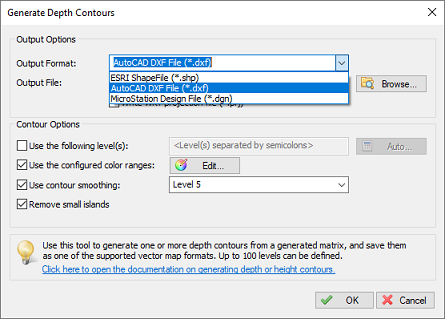 At this moment the supported file formats are: AutoCAD DXF file (default), Microstation DGN file and ESRI shapefile. 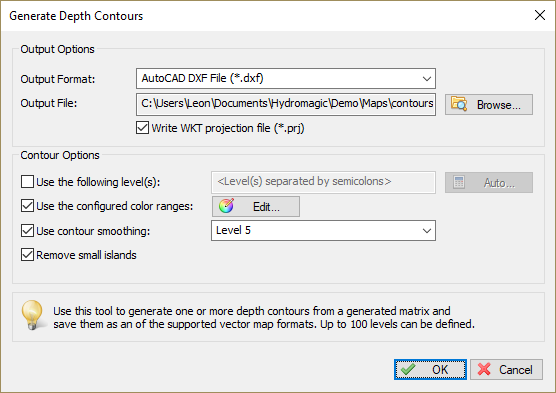 The generated contour lines will be written to a file with the selected output format and added to the project. Click the "Browse..." button to select the location and file name of the output file. When the file name already exists, the software asks you whether to overwrite the existing file first. 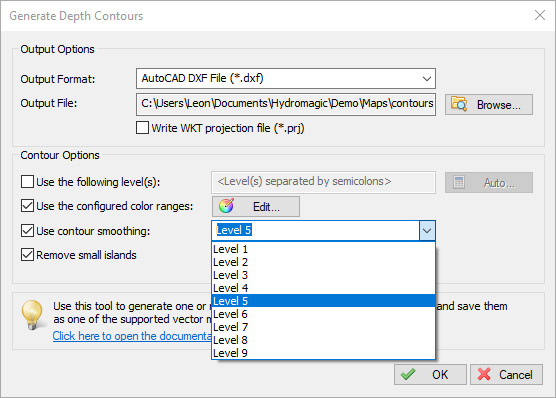 Enabling this option causes the contouring tool to write projection information for the generated file to an OGC WKT projection file. 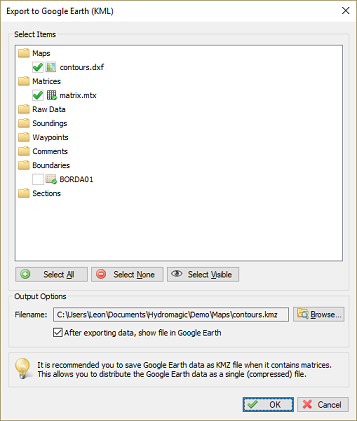 When this file is present in the same folder as the file itself, and as long the file isn't renamed, you do not have to select a map projection each time the file is loaded. You can generate contours using fixed level(s), or use color ranges. You can also combine the two options. Using a fixed level can be useful, to display a reference line (for instance the dredging depth) to see what's above and below this line. You can enter multiple levels by separating them using semicolons. When using the color ranges, the levels displayed as colors will be accentuated. When generating depth contours from a TIN model containing large triangles, it happens often that sharp edges appear in the contour lines. To make the lines look more pleasant for the eye, you can enable the "Use contour smoothing" option to use a B-Spline algorithm to smoothen the lines. Please note that choosing a higher smoothing level will slow down the contour generation process. 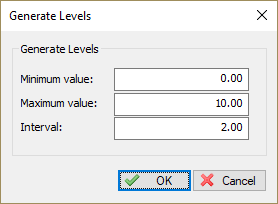 The level settings allows you to set the degree of smoothing. When using level 1, just a little bit of smoothing is applied, while level 9 applies the most. A good value to start with is level 5. When contours are starting to cross, you might want to try a lower level. When all settings are correct, click the "OK" button to finish the process. The software will now create the TIN model, and generate the contour lines. You will have to wait a couple of seconds, depending on the number of records your sounding contains. When ready, the dialog will disappear, and the contours are drawn on the screen. 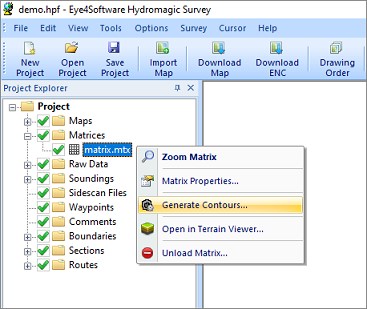 To temporary hide or show a collection of contour lines, just click the "eye" icon in front of the contour name. When hidden, the contour is still loaded, but just not shown on the screen. 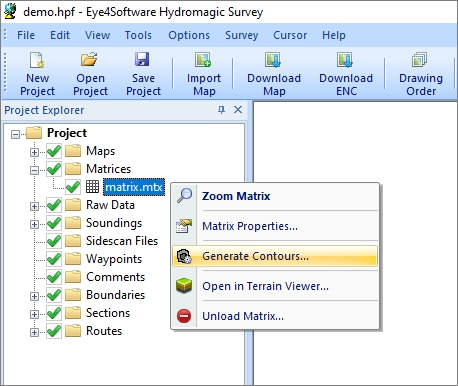 To remove a collection of contour lines fopm your project, look for the name in the "Project Explorer" and right click on it. Please note that the contour map is only removed from the project. The file will not be deleted and stay in the project folder. Select the "Remove Map..." option from the popup menu, and confirm the action. 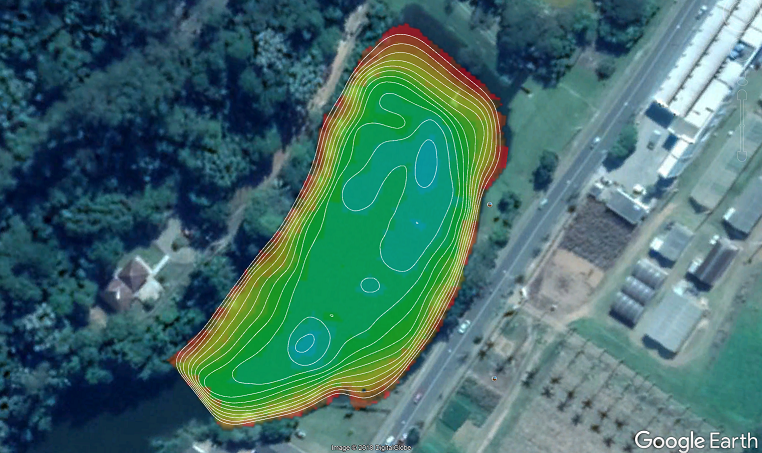 Once the contours have been generated and added to the project, you can also export the contours as Google Earth KML file. 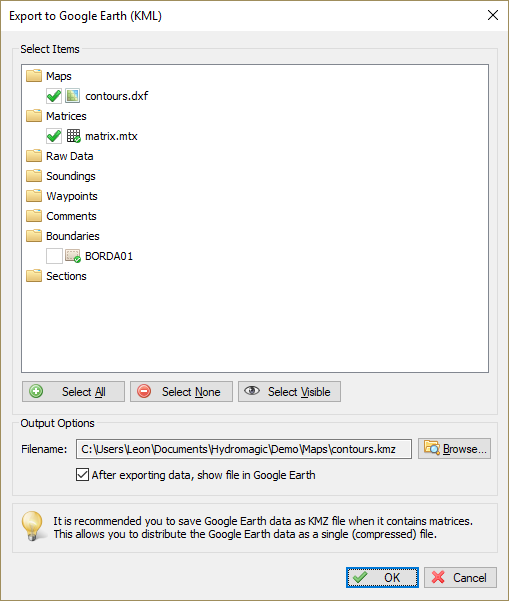 You can open the "Export KML data" tool directly from the "File" => "Export" menu. 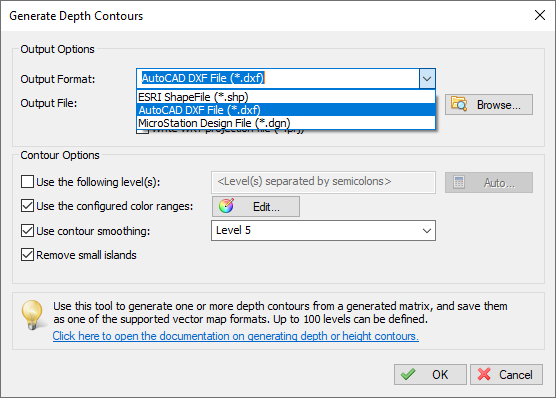 This video tutorial shows how to generate contours from a single sounding and shoreline file with contour smoothing.